On Saturday, April 20 from 11h30 to 12h45 head on down to Musgrave Shopping Centre (on level 2 opposite Nedbank) and meet the cast of The Kandasamys who are doing their promotional movie tour throughout the Province. What a great way to spend the Easter weekend! There will be an opportunity to win some spot prizes, meet and greet your favourite local celebrity and get that all-time favourite “selfie shot”. (T’s & C’s apply). 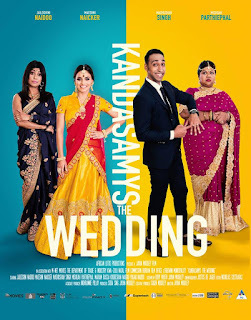 Kandasamys: The Wedding was filmed in Chatsworth as well as in and around Durban and highlights two families who are neighbours on the verge of becoming one big, happy family – The Kandasamys and the Naidoos. It’s been a few years since Jennifer Kandasamy and Shanthi Naidoo rekindled their once tainted friendship and the two could not be happier that their children Jodi and Prishen are to be wed. It’s the week before the big day and emotions are heightened. It’s colourful and loud and vibrant and spirited as everyone gets into the wedding week mood. Jennifer holds the reigns to all the wedding preparations and Shanthi focuses on the festivities held by the bridegroom. The story weaves against the backdrop of an Indian South African wedding and Jodi and Prishen’s love is put to test once again by the ones who claim to love them the most – their mothers. Jennifer and Shanthi have to learn how to let go of their children so that they can be happy and in turn realise that in the end, their children’s happiness is the source of their own." Meet your favourite cast members: Jailoshini Naidoo, Maeshni Naicker, Mishqah Parthiephal, Madhushan Singh, Koobeshen Naidoo, Ugan Naidoo and Vashir Kemraj. The host will be Madhushan Singh, who plays the part of Prishen Naidoo, (Preggie and Shanti Naidoo’s son) and Jodi’s boyfriend / fiancé. For more information call Musgrave Shopping Centre during office hours on 031 277 8420.